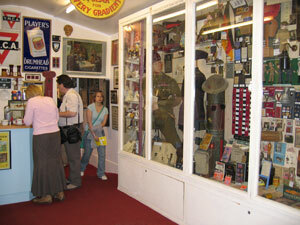 Over thirty large display cabinets housing numerous fully uniformed mannequins and associated memorabilia. Illustrating the history and development of both allied and Axis Military and Para Military Uniforms from the period 1895 - WW2. Boer War memorabilia — Army Motor Reserve (c1908) Uniform etc. Army Pigeon Service Display. A superb display of uniforms, insignia and accoutrements of the Eton College Rifle Volunteer Corps c1890 - 1936. WW1 British and American, other Ranks and Officers, Army and Royal Flying Corps uniformed mannequins, General Allenby’s (of Lawrence of Arabia association), Staff Car Pennant etc, R,F,C, display, Air to Ground message streamer, with original message (alongside scale model aeroplane Tiny the RAMC mascot dog with associated dog tag, medals photograph, helmet, etc. - l00’s of WW1 collectibles from matchbox covers and sweetheart brooches to trench sirens and periscopes, to Officers issue knuckle duster dagger and gas masks, etc. Spanish Civil War memorabilia display - uniformed mannequins of WW2 8th Army officer, Royal Navy Officer with sword, RAF Officer of Air Rank in Mess Dress with medals, RAF Fighter Pilot with all flying equipment, home Guard Officer. The superb memorabilia displays include: Escape and Evasion with original Colditz Castle items. escape compass buttons (Brtish and American) etc. SOE suitcase radios, GFM. Montgomery’s Car Pennants and associated display, the Two Types original artwork and models, the Royal Navy, Army, Royal Air Force, Home Guard, etc. AAC Sergeant, WAAC Officer, Italian Officer. Wehrmacht and Japanese soldiers. Nazi little boys Wehrmacht’ play uniform ATS, Wrens and WAAF and (US) WAVE Officers etc. female ARP/Civil Defence, Air Transport Auxilliary, Parachute Regt. Officer (later ADC to The Queen), etc. 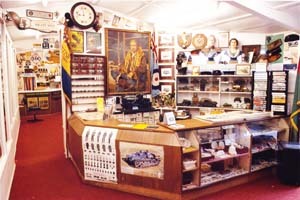 Superb Allied and Axis memorabilia displays of all the WW2 fighting services. Extensive British Home Front displays of the ARP, Civil Defence British Legion, Royal Observer Corps, Bomb Disposal, WVS, NFS, AFS, WLA 44Wl and WW2), Red Cross and Medical Services, ATA, etc. WW2 Nora Wellings military doll display, large District/Factory etc ARP badge/armband and membership card display.